Wireless Networks solution from ConceptDraw Solution Park extends ConceptDraw DIAGRAM diagramming software to help network engineers and designers efficiently design, create and illustrate wireless network diagrams. The solution contains a comprehensive library of objects for drawing different types of wireless network diagrams. Sample 1. 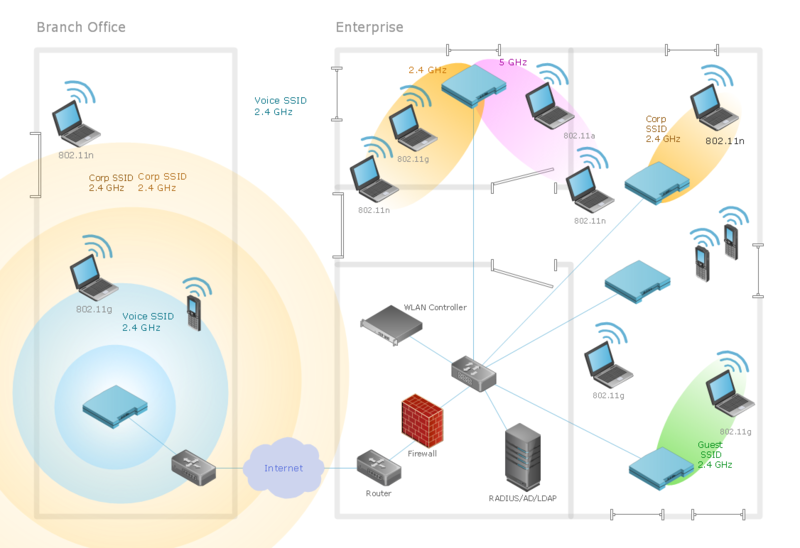 Wireless network diagram: Ultra high performance WLANs. This diagram was created in ConceptDraw DIAGRAM using the Wireless Network library from the Wireless Networks solution. ConceptDraw DIAGRAM v12 is a Wireless Network Drawing Mac OS software. ConceptDraw DIAGRAM v12 is a Wireless Network Drawing software to create and illustrate wireless network diagrams.